Cold-water powder dyes which are mixed with water and used with Soda Ash and household salt. 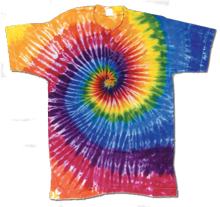 The traditional dye for tie-dyeing, for batik, space-dyeing, graduated dyeing and more. Will dye plant-based fibres include cotton, linen, viscose/rayon etc. Dyes will often take on a different strength on different fibres. Procion dyes will also work on silk, but may give a paler hue. 19g bottles are suitable for most purposes, but we can also supply 227g (8oz) and 454g (16oz/1lb) bottles to order (delivery often 3-5 working days as long as they are in stock). See www.jacquardproducts.com for instructions and mixing details.